At Above Ground everyone is welcome, everyone can be themselves, and everyone will find hair services they are looking for. With a diverse staff that covers all ends of every spectrum our stylists and barbers service all hair types and styles including naturally curly cuts, dry cutting, styling, fades, all color services including vivid colors, precision cutting, wedding styling, and textured hair treatments. Above Ground also offers a carefully curated music and art experience each time you walk through the door. The founder, Ashe is queer and has been serving the queer community for about 20 years. Our team is committed to servicing everyone with grace, respect, and inclusivity, and doing some damn good hair. Ashe has been bringing a natural understanding of trend and precise perception of what is up-and-coming in fashion, music and culture to styling clients for 15 years. An international education and apprenticeship in hair styling, cutting and coloring informs their distinct and sought after methods as a hairdresser. From session styling for Kevin.Murphy, to editorial work in London - Ashe is an inexhaustible source of energetic innovation, specialized in naturally curly hair, short hair, Balayage, short haircutting and fades. Brian Sanderson started doing hair in 2011. He always engages with his clients to learn their needs, expectations, and lifestyle to provide the best possible cut and color. Brian loves highlighting, enhancing the natural tones and beauty already present in the hair, as well as fashion colors. A graduate of the Aveda Institute, he is Vidal Sassoon cutting and Goldwell color trained. Brian is currently on temp leave. Text Brian at 415-407-8248 to book an appointment. Shaun has been doing hair for 14 years plus. He sees hair as his passion and art to create. Specializing in cutting, natural blending of highlights and colors as well as fashion colors. He has been and educator for Aveda along with runway and editorial work all over Denver. Stacy has spent the last 12 years perfecting her skills as a stylist. She loves to be creative and brings a fresh edge to everything from avant-garde styles to classic looks. Having undergone training with Wella, Redken, Matrix, Swarzkopf and Paul Mitchell, Stacy has a deep understanding of color and has an artistic and creative talent for transforming hair. From bold vivid colors, to natural subtle highlights and everything in-between, color is one of her passions. Pixie cuts, asymmetrical styles, precise fades and long layers are her specialties when it comes to cuts. Stacy draws creative inspiration from working with a variety of styles and clients, and uses that inspiration to create new and exciting looks for all of her clients. Lakshmi approaches each cut, style, and color with a wealth of experience and serious creative edge. Lakshmi is ready for everything color: dramatic bright colors, balayage, natural highlights, and gray coverage and uses Wella, Pravana and Pulp Riot. Also ready for all cutting, she particularly loves doing short fades, pixies, long layers, precision a-lines, as well as texture and razor cuts. She can also give Olaplex treatments and eyebrow and lip waxing. With 13 years as a stylist, Lakshmi is happy to now call Above Ground her salon. Christoph Key is a licensed International Hairstylist based out of Denver. He specializes in hair extensions and works with many installation techniques including tape-ins, braided and braidless sew-ins, beaded, and customized clip-ins. 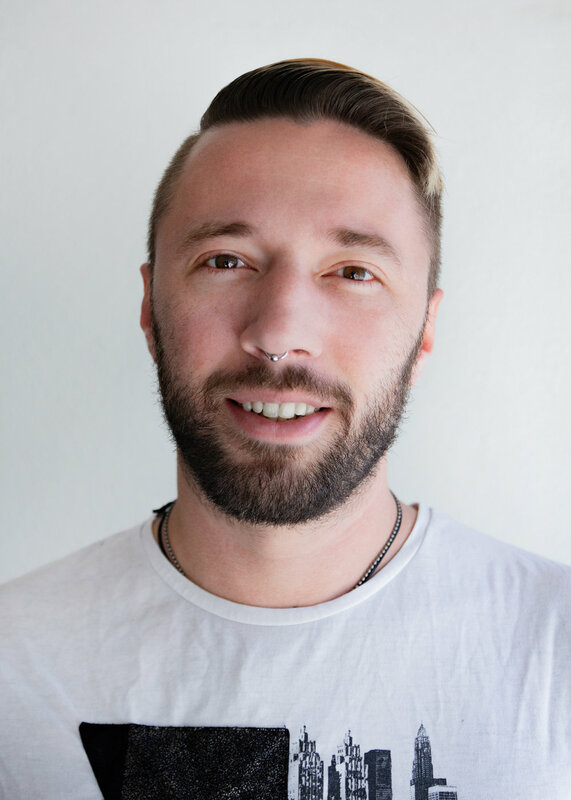 His passion for long hair and balayage has earned him a loyal clientele, and he prides himself on professional finishes. Christoph has many years of experience with a range of cultural hair styles and different, natural hair types. Follow this link for further information on hair extension services by Christoph.